This photo tour of historic, sophisticated and charming Charleston, South Carolina offers a pictorial glimpse of this captivating Southern city. Listed as a National Historic Landmark, St. Philip's Episcopal Church was the first Anglican church established south of Virginia and is home to the oldest congregation in South Carolina. Because a light that was placed in the steeple guided ships to the Port of Charleston, St. Phillip's became known as The Lighthouse Church. Photo Credit: © 2007 George Alexander, licensed to About.com, Inc. This group of brightly painted restored houses, known as Rainbow Row, features Caribbean influenced colors. The art of Sweetgrass (or Sweet Grass) basketry is passed down through generations of Gullah families in and around Charleston, South Carolina. The baskets pictured above are from Bev's Sweet Grass Baskets & Things, Charleston. A popular way to tour the Charleston historic district is by horse-drawn carriage. Even in the winter, a walk around Charleston offers charming garden views. Whether having a casual or a serious interest in historic architecture, visitors to Charleston are sure to be fascinated with the array of architectural styles and wonderful restorations to be enjoyed at just about every step. Pictured above, the Calhoun Mansion, an Italianate manor house constructed in 1876, is the largest house in Charleston and one of the nation's finest post-Civil War houses. The Calhoun Mansion, which offers tours, is located at 16 Meeting Street. 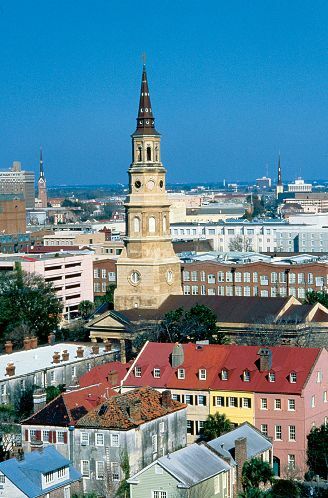 The Battery, located at the southern end of the Charleston peninsula where the Ashley River and the Cooper River meet, is a popular Charleston tourist destination. Things to enjoy and explore in the Battery area include some of Charleston's grandest historic homes, several statues and informational plaques, displays of Civil War artillery, White Point Gardens shaded by majestic live oak trees, views of Charleston Harbor and more. Located near the corner of Concord Street and Vendue Range (Note: The eastern end of Queen Street changes to Vendue Range at East Bay Street. ), the Vendue Wharf pier, located in Waterfront Park, stretches over marsh grasses and the Cooper River. A wonderful place to relax, the pier offers great views across the river of the USS Yorktown at Patriot's Point and large shaded swings, tables and benches. Located in Waterfront Park, a short walk from the Waterfront Park Pier, Charleston's Pineapple Fountain represents the welcoming hospitality for which Charleston is so well known. This fanciful fountain provides a great backdrop for a photo of your visit to Charleston. Located across the Arthur Ravenel Jr. Bridge in Mt. Pleasant, about ten miles from downtown Charleston, antebellum Boone Hall Plantation, listed on the National Register of Historic Places, is one of the oldest working, living plantations in the United States. The plantation's Avenue of Oaks, first planted in 1743, is a picturesque three-quarter mile drive lined by majestic live oak trees, forming a tunnel of seemingly sculptural branches embellished with cascading Spanish moss. Photo Credit: © 2007 C. Giffen, licensed to About.com, Inc. Dedicated and opened on July 16, 2005, the Arthur Ravenel Jr. Bridge (also called the Cooper River Bridge), connects downtown Charleston to Mount Pleasant via Highway 17. In grand Charleston style a black tie celebration held on the bridge between the diamond towers, fireworks displays and other pre-dedication events took place during the week before the ceremony. The span of the Arthur Ravenel Jr. Bridge is the longest cable stay span in North America. The diamond towers were named the John P. Grace Tower and the Silas N. Pearman Tower in remembrance of former bridges that were replaced by the new bridge. The South Carolina Aquarium, which opened in May of 2000, is located at 100 Aquarium Wharf, located on the historic Charleston Harbor at the end of Calhoun Street.